The Natural Stone Council is committed to supporting sustainable initiatives and innovations at all levels of the production of Genuine Stone® products. As such, the NSC has established a Sustainability Committee made up of key industry members to elevate the issue of sustainability within the industry and provide a body responsible for planning and implementing relevant initiatives. In 2007, the NSC Sustainability Committee engaged in a partnership with the Center for Clean Products (CCP) at the University of Tennessee to assess current industry operations relating to dimensional stone production. In 2011, the NSC Sub-committee further reviewed and updated this document. The best practice identified and presented in this document is a direct result of the NSC and CCP’s efforts to identify and improve the environmental profile of the natural stone industry. serve as a reference standard. The raw material is also the final product (sometimes with the exception of a small amount of resin or adhesive). The location of raw material production is uncontrollable. Each deposit is unique, offering specific aesthetic and physical properties. Although the first is a positive characteristic on its own as it eliminates transportation of additional ingredients to the fabrication site, coupling it with the second and third characteristics causes transport to play a significant role in the stone industry worldwide. Since quarries must be located where the geologic deposit has formed, and projects may call for a very particular appearance, shipment across the globe may be unavoidable. Adding the fact that stone is relatively heavy, transportation of the material can quickly become expensive economically as well as environmentally. Implementing transportation management promotes shipment efficiency, ultimately minimizing negative impacts to the environment and reducing costs. A comprehensive and proactive transport strategy can also improve carrier-shipper relations and enhance the quarry or processing facility’s repute for social responsibility. In fact, a FedEx transportation benchmark study demonstrated that higher customer service level and lower transport expenses were seen in companies with a strategic transportation plan (Younkin 2006). This document provides guidance to develop and implement such practices. Transportation is a highly complex and dynamic element of the natural stone industry. As such, it provides great opportunity for continuous improvement that result in cost savings, a reduced environmental footprint, and more efficient shipment overall. This document offers practices that can lead to the realization of these benefits. Transportation in the stone industry is unique to each company and even to products within a company. The simplest route a product can take is directly from the quarry to the processing plant to a customer. Some companies’ quarry and fabrication facility are located at the same site, while others can be miles apart. Alternatively, a quarry may sell blocks or slabs to a separate company for processing and sale as a finished product. Moreover, with fabrication businesses located across the globe, the potential exists for stone to travel between continents. Stone quarried in North America is sometimes sent to countries with low labor costs, particularly China, for processing. The product is then sold back to the United States or Canada, sometimes being marketed as imported stone, although the quarry from which it came actually resides in North America. Even considering the transportation expenses to process abroad, stone industry members indicate that the incredibly low labor costs can render this fabrication approach significantly less expensive than if the same stone was processed in North America. Suppliers and distributors also play a role. These industry members purchase raw pieces from quarries, or finished products from fabricators; some purchase both. The requested stone is shipped from the quarry or processing site to warehouses, which are often located at convenient distribution locations. Once a customer’s order is placed, a final transport step occurs to deliver the product to the job site. As evident, stone can be transported any number of times between the quarry and place of application. Moreover, any combination of trucking, rail, or shipping can be employed. A company can greatly benefit by managing these complexities with a holistic approach that includes maximizing efficiency, maintaining continuous communications with carriers, and ongoing evaluation of practices. Implementing such a comprehensive transportation plan will reduce costs, increase company reputation for on-time delivery, promote constructive relationships with the supply chain, and mitigate environmental impacts. Shaw et al. 2003; Facanha and Horvath 2007; CPW 2009). As shipping is predominantly employed for overseas transport, its competition with regard to transportation modes is aviation. However, since stone is likely never shipped by air, the comparison is irrelevant to this document. Further, it is inappropriate to compare shipping to truck or rail, unless speaking of barge or coastal transport. As such, any comparison of waterway transport to other modes in this document is limited to such movement. Environmental impacts associated with water vessel operation include (nonrenewable) energy consumption, displacement of ecosystem elements, discharge of oily bilge and ballast water, disposal of non-biodegradable solid waste in the ocean, and air emissions. Dumping is regulated under the Marine Protection, Research, and Sanctuaries Act, and emission standards have been promulgated for engines. Emission standards for marine engines are based on the rated power of the engine family employed and include a standard only for the total hydrocarbon and NOx emissions. For any engine less than 4.3kWh, a flat standard applies, while engines with a rating that equals or exceeds 4.3kWh must comply with standards that are calculated based on the particular rating. Emission limits have been steadily decreasing in magnitude since the 1998 model year, with the “hydrocarbon plus NOx” constraint of 278g/kWh dropping to 81g/kWh for 2006 and newer engines (OAR 1997). Ideally, alternative fuels will be implemented to further mitigate these harmful emissions. Although still unregulated, discharging ballast water can be particularly environmentally harmful. Water is taken in at one port, stored in a vessel’s hull, and released at another port, bringing with it a multitude of organisms that can disrupt the new ecosystem. The invasion of the Great Lakes by zebra mussels is a prime example; effects of the species are described at https://www.glc.org/work/mussel-collaborative. No conventional mode of transportation is without negative environmental consequences, but numerous studies conclude that rail has the most favorable profile, particularly with regard to CO2 emissions (Barth and Tadi 1996; WBCSD 2001; Shaw et al. 2003; Facanha and Horvath 2007; CPW 2009). The EPA regulates locomotive emission standards based on year of manufacture; Tier 0 includes those built from 1973-1999, Tier 1 comprises 2000-2004 models, and Tier 2 applies to 2005 and later models. Tier 2 standards drop emissions 70%, 42%, and 67% for CO, NOx, and particulate matter, respectively, as compared to Tier 0 standards (OAR 1997). The natural stone industry transportation best practices center on four interconnected principles: efficiency, relationships, evaluation, and sustainability. The first concept includes all aspects related to the physical movement of natural stone from the quarry to a job site, while the second involves maintaining effective interaction between shippers, carriers, and customers. The third principle aims to identify strengths and weaknesses of the transportation process as a whole, working toward overall improvement. Finally, some additional sustainability concepts are provided to help reduce the environmental footprint of the supply chain and convey the company’s status as an eco-conscious company. Efficiency refers to not only operations but economics and sustainability, which are often quite interlinked as a leaner system can generate financial and environmental benefits. Most fundamentally, optimization of mileage and fuel efficiency result in cost and emissions savings per cubic foot of stone transported. such high quality practices. A multitude of methods are available to assist in evolving to this type of business. Overall, centralizing freight management increases collaboration and solution strategies across the supply chain, leading to clearly defined opportunities and return on investment (ROI). Less than Truck Loads (LTL) and Less than Container Loads (LCL) are more costly than moving a full truck or rail car. For instance, shipping a single cubic meter crate by itself can be four times more expensive in an LCL than transporting the same crate within a consolidated load (GNLC 2006). Shipments can be consolidated by implementing multistop routes or using consolidation hubs and cross-docking. When implementing cross-docking, revisit the strategy whenever a significant change in shipping needs to occur, such as the addition or deletion of a routine stop. Appropriate equipment: When shipping via truck, ensure that the trailer provided by the carrier is a proper size for the load. A shipper may pay an extra 10% more for product transport when a trailer that is too small or too large for the load is employed (GNLC 2006). Avoid this expense by asking questions to determine an appropriate trailer capacity, and speak with the carrier as soon as possible if the load changes to increase the likelihood that a proper truck can be found in time for transport. Equipment operation: Employing carriers that provide trucks with fuel-efficient attributes and implement frequent maintenance may result in a lower cost for the shipper due to the smaller volume of diesel needed. 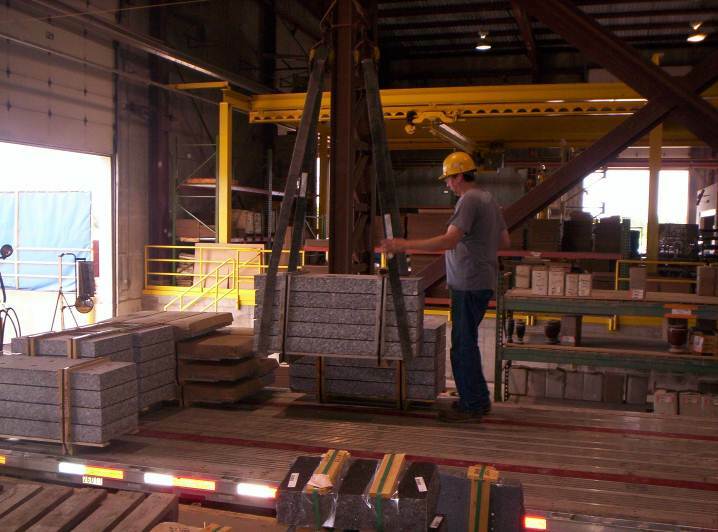 These practices are also valuable for shippers moving stone around their own facilities. Ensure proper tire inflation is maintained to avoid unnecessary rolling resistance and tire wear. Automatic Tire Inflation (ATI) systems are available to assist with this. materials, such as aluminum frames and axle hubs, without compromising durability. This reduction drops fuel consumption by 0.11mpg at 65mph. Utilize low-friction lubricants in the drivetrain and engine to mitigate friction losses and increase fuel efficiency. Require carriers to implement maximum speed policies for drivers. In addition to reducing fuel consumption, this practice assists in maintaining the safety of everyone on the road. Mechanical and electronic “governors” can be installed by carriers to monitor truck speed. Stipulate that drivers are trained on fuel reduction techniques, including topics of shifting methods, route selection, acceleration, idling time, number of stops, and use of accessories. Although new vehicle technologies & trailer designs, when available, should be employed to increase efficiencies of fuel consumption, a more important aspect to consider is the continuous upkeep and maintenance of any fleet. Total environmental impact should be reviewed to consider the manufacturing of new fleet equipment against the replacement of existing fleet equipment. When loading stone, a trailer’s weight capacity will typically be reached before the bed area is filled. Be sure to carefully distribute the stone across the bed such that the trailer is properly balanced. Incorporate the bed’s tie-down areas into the loading plan to ensure that the stone can be secured correctly. Maintain a safe transport by always using appropriate tie-down techniques. Secure the stone so that it is physically impossible for the product to slide around the bed. This process is sometimes referred to as blocking out. Protect edge and corners of stone to prevent damage; injured pieces can result in lost money, generation of waste, and poor customer approval ratings. Ensure that the loading area is always tidy, and stone can easy be moved on to the transport vehicle. Being organized will facilitate on-time pickups and promote safety in the loading area. Additionally, minimizing the amount of time a truck idles at the facility will avoid unnecessary air emissions and potential occupational exposure to diesel exhaust. Purchase reusable packaging supplies, and reuse them if possible. Continuous expenses for the purchase of throw-away materials can be reduced or eliminated. Minimize the use of plastic wrap, which is fabricated from petroleum products (a nonrenewable resource) and not able to be recycled by some communities. calculate the most efficient method. can be effective in storing vast quantities of shipping information, but ensure that any data stored is copied on a device external to the computer! Due to high costs of purchasing and operating these programs, employing SaaS3 and outsourcing to a 3PL may prove more economical. Consider hiring a freight forwarder: Transportation logistics can become complex and timeconsuming. Hiring a third-party service provider can not only take this weight off of (perhaps less knowledgeable) company employees but can offer complete supply chain management and expertise in transport strategy. Additionally, the costs of purchasing TMS and EID programs are avoided. Maximize import/export compliance: Understanding laws of import and export can save a company from fines, penalties, and lost time for noncompliance. These regulations can become complex as a wide range of items must be considered, including customs, duties, rebates, refunds, remissions, and taxes. Freight forwarders can provide support with these issues, particularly if they have licensed customs brokers on staff. Employ rail if possible: As previously described, rail is generally less environmentally burdensome than trucking. Transport stone by rail when possible. one side can incite the same from the other, ultimately resulting in a productive and pleasant relationship. Incoterms 2000 Shipping Terms, a framework developed by the International Chamber of Commerce that defines international transaction and shipping provisions, may provide assistance with this. More information can be accessed at https://iccwbo.org. Customs-Trade Partnership Against Terrorism (C-TPAT) is a voluntary U.S. government program that emphasizes transparency, education, and relationship building to improve the security of imports and exports, as well as the security of the nation, particular at the border. Details are located at https://www.cbp.gov. Be driver-friendly: Provide convenient on-line scheduling for pick-ups and self-invoicing where the shipper approves payment upon notification of delivery. Be prepared for pickup at the set time, and ask for feedback to understand the improvements that can be made. transport the stone. Web-based communications, such as TMS and EDI programs, will aid this effort. Communicate with customers: Ensuring customer satisfaction can only be accomplished through interaction with clients. Ask for feedback with respect to minimum expectations—being on schedule, having sufficient packaging, arriving without damage—as well as items that go above and beyond, such as ease of ordering and friendliness of both the shipper and carrier. maintain low costs and remain competitive in the market. and even suggestions to be made regarding how to achieve those advancements. Assess resources: Evaluate the (administrative) finances spent on the transportation system, and learn about external resources that could provide assistance. Partnering with transport planners to evaluate and form an appropriate shipment strategy may save the shipper from significant expenses in the long-term. Additionally, hiring a firm to manage shipment may prove more cost friendly than dedicating internal, less knowledgeable resources to the task. imperative need to fill a container). The former can assist when reassessing carrier contracts, allowing the shipper to negotiate competitive rates. Communicate performance: Be sure to convey transportation performance to carriers. Improvements can be made by working through challenges together and proactively discussing upcoming shipping needs, such as seasonal fluctuations or modification to the customer list that may alter shipping patterns. The supply chain cannot improve unless it knows where improvement is needed. Re-evaluate: Changes to the transport system are particularly dynamic. Fuel costs, carrier expenses, and customers all can vary widely. Taking a second look at a previous decision, even if that decision was relatively recent, can help minimize costs resulting from system variables. Optimization programs, such as TMS, may prove valuable in this purpose. A strategically constructed and clearly communicated transport plan, can control both financial and environmental impacts . It is imperitive the entire supply chain is held to meet high standards of operation, and its participants are committed to the program. Implementing the best practices described in this document can prove advantageous with respect to economics, operations, and the environment. For questions regarding the content of this brochure or to learn more about the Natural Stone Council’s sustainability efforts, please visit the NSC website at http://www.naturalstonecouncil.org or contact the NSC Executive Director, Duke Pointer, by email. Ang-Olson, J and S Ostria. 2005. Assessing the effects of freight movement on air quality at the national and regional level. Final Report. ICF Consulting. Prepared for U.S. Federal Highway Administration.Washington, DC. https://www.fhwa.dot.gov/environment/air_quality. Ang-Olson, J and W Schroeer. 2002. Energy efficiency strategies for freight trucking: potential impact on fuel use and greenhouse gas emissions. Transportation Research Record No. 1815: 11-18. Barth, MJ and RR Tadi. 1996. Emissions comparison between truck and rail: case study of California I-40.Transportation Research Record 1520: 44-52. Center for Ports and Waterways (CPW). 2009. A modal comparison of domestic freight transportation effects on the general public. Texas Transportation Institute. Houston, TX. Clean Air Task Force (CATF). 2005. An analysis of diesel air pollution and public health in America v1.3. Boston, MA. http://www.catf.us/resources/publications/view/83. Facanha, C and A Horvath. 2007. Evaluation of life-cycle air emission factors of freight transportation. Environmental Science Technology 41(20): 7138-7144. DOI: 10.1021/es070989q. Government of Newfoundland and Labrador—Canada (GNLC). 2006. Transportation best practices manual. Canadian Manufacturers and Exporters Newfoundland and Labrador Division. Transportation and Works. http://www.tw.gov.nl.ca/publications/bestpracticesmanual.pdf. Murphy, JV. 2006. Best-practice companies redefine the basics of freight management. Global Logistics and Supply Chain Strategies: 40-50. Office of Air and Radiation (OAR). 1997. Emission Standards Reference Guide for Heavy-Duty and Nonroad Engines. USEPA. EPA420-F-97-014. https://www.epa.gov/vehicles-and-engines. Office of Transportation and Air Quality (OTAC). 2000. Regulatory Announcement Final Emission Standards for 2004 and Later Model Year Highway Heavy-Duty Vehicles and Engines. USEPA. EPA420- F-00-026. Washington, DC. https://www.epa.gov/vehicles-and-engines. Shaw J, Walton W, and J Farrington. 2003. Assessing the potential for a ‘railway renaissance’ in Great Britain. Geoforum 34: 141–156. USEPA. 1999. Smog—Who does it hurt? What you need to know about ozone and your health. Air and Radiation Office. EPA-452/K-99-001. Washington, DC. https://www3.epa.gov/airnow/health/smog.pdf. USEPA. 2007. Effects of Acid Rain. Washington, DC. https://www.epa.gov/sites/production/files/2015-08/documents/2007arpreport.pdf. World Business Council for Sustainable Development (WBCSD). 2001. Mobility 2001 – World mobility at the end of the twentieth century and its sustainability. Accessed 4 May 2009. Younkin, M. 2006. Where are you on the transportation best-practice continuum? FedEx Services. 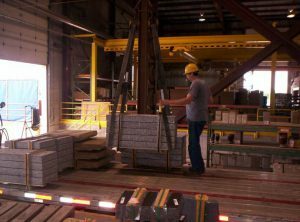 An organized loading deck promotes safe working conditions as well as expedited pick- ups and deliveries. One of the largest natural stone quarry and fabrication companies in North America, Cold Spring Granite’s (CSG) strategic transportation planning has earned the corporation exceptional savings to the tune of over one million dollars. Three key practices are responsible for the heightened efficiency of CSG’s outbound shipments: establishment of a centralized logistic team, partnership with a local third party logistics (3PL) company, and implementation of a state-of-the-art freight optimization software program. The centralized logistics team allows CSG to manage the freight of all (seven) of their product lines as if they were one, while the 3PL has given the company access to a greater diversity of freight carriers. The optimization software allows CSG to choose the best carrier for the shipment, create fuller loads, and travel the least amount of miles possible to complete the transaction. CSG’s team has also implemented a zone shipping concept for two product lines, which involves shipping to one section of the United States one week and the other section the following week. “This reduces the number of shipments per week and allows our weight per shipment to be increased by consolidating orders,” explains Konop. Using proper tie-down equipment and techniques helps to avoid damage during transport. Since the inception of the three-pronged management system in January of 2008, CSG has seen a 22% reduction in overall outbound freight costs, equating to over one million dollars in corporate savings. Much of CSG’s inbound volumes are tied to steamship lines and ocean containers from foreign granite suppliers in India, China, Brazil or Italy. A small percentage of these containers are direct shipments to CSG customers, but the majority is moved via rail from the U.S. port city to Minneapolis, Minnesota (for fabrication) and then transported by a drayage company to Cold Spring, Minnesota. This process involves deconsolidating the container, building shipping schedules, loading trucks, and then re-shipping the product to customers. Historically, all of CSG’s imports arrived at ports on the West or East coast and were trucked to Minneapolis or a project site. In some cases, this resulted in the need to drive stone completely across the country. CSG decided to open a cross-docking warehouse operation four miles from the port in Pasadena, Texas in order to reduce trucking distances as well as transport duration. Pasadena was chosen because of its’ centralized location, cutting trucking for cross-country shipments in half. All monumental products are now brought into port, deconsolidated at the warehouse and then shipped directly to customers. The following tables describe the savings in mileage resulting from opening the Pasadena warehouse. Although, CSG’s import volume does not merit establishing a cross-docking warehouse on both coasts, opening the centrally-located facility has yielded excellent reductions in miles traveled, fossil fuel consumption, air emissions, and transportation expenses. In addition, establishing the warehouse has enhanced their service to certain customers. CSG’s Director of Purchasing & Logistics, Steve Konop, asserts, “At Cold Spring Granite, the goal of the Traffic Department is to move our inbound and outbound product with the minimum amount of freight miles per truckload or shipment while simultaneously carrying the maximum amount of weight.” Although perhaps not specifically stated, this objective is also minimizing Cold Spring Granite’s environmental footprint. A little efficiency can go a long way.